Radon (Rn222) is an inert gas that is generated in the soil when Radium decays. It is the third major transformation in the radioactive decay of Uranium, and like its parents radon is a radioactive element. It has also been determined to be a factor in many lung cancers classified as a group carcinogen by the Environmental Protection Agency. 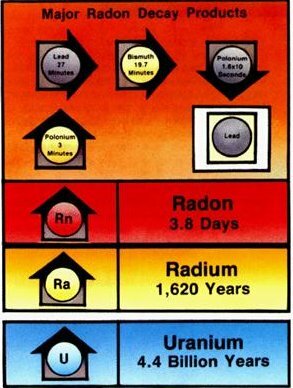 Radon is not the final stage in the Uranium-238 decay chain. Although it has a much shorter half life than Uranium and Radium, it breaks down in a mere three and one half days (3.7 precisely), it’s decay gives birth to a group of elements which are known as the heavy metals, Polonium, Bismuth and Lead. These elements are called the radon daughters because they are brought into being by the existence of their parental element, radon. Unlike radon, these elements are ionized. They have a charge and they readily attach themselves to various materials in the environment. The decay of radon-222 with emission of an alpha particle is followed within about an hour by a series of four further decays, two of them accompanied by emission of alpha particles and the other two accompanied by other types of radiation. They are actually isotopes of polonium, lead, and bismuth, but they are referred to collectively as radon daughters, or, by those sensitive to questions of gender, as radon progeny. They float around in the air during their few minutes of existence, often becoming attached to dust particles. In summary, a radon atom in the air decays within a few days into its short-half-life radon daughters, which decay within about an hour; with these decays, three alpha particles are emitted, one by radon and two by its daughters.